Readers first met Shona MacLean’s 17th Century academic Alexander Seaton when he was teaching at a school in the Scottish town of Banff in 1626 and then followed him on a quest to Ireland a couple of years later. In CRUCIBLE OF SECRETS (or just CRUCIBLE I think in the UK) it is 1631 and Alexander is back in Scotland, now a Master at Marischal College in Aberdeen. When the college librarian is murdered in a rather gruesome way Seaton is asked by the principal to investigate matters with a view to ensuring that nothing about the man’s death (or life) emerges to damage the college’s reputation. The brilliance of MacLean’s first novel in this series, THE REDEMPTION OF ALEXANDER SEATON, was such that it allowed me to give the series another chance after being pretty disappointed with the second book (I was so underwhelmed I didn’t even bother to review it). I’m chuffed to report that, for me, MacLean was back on form with this instalment, focusing on the things she does very well. The first of these is to depict a very enveloping setting. The novel transports the reader back in time to the all–male colleges of the era, a world in which justice is dealt with more speed than accuracy and one must live one’s life according to a long, and strict, set of rules. MacLean explores this element particularly well by placing several characters in what would today be minor trifles but were then major crises and watching these scenarios play out is completely captivating. At one point for example Alexander’s wife Sarah becomes virtually catatonic at the hint that his investigation might be leading him to have something to do with a secret society; it might sound silly that such a thing could cause worry but MacLean does such a good job of building the drama that we too believe a single word on a piece of paper is deathly dangerous. I adored visiting 17th Century Scotland but I’ll admit to being rather pleased to return to the 21st Century. Another of MacLean’s great skills is her development of imperfect, credible characters. At the start of this novel Alexander seems to be at his most settled, having redeemed himself for past poor form, survived the dramatic events of finding out he is part of a family that half of Ireland wants to wipe out and finally having married the woman he loves and secured the job he has dreamed of. But he is soon tormented by jealousy which threatens to cripple him and this thread, exploring as it does the notion we are often our own worst enemies, is expertly woven into the novel and makes Alexander far more ‘normal’ than he might otherwise be. Other people in the novel are also driven by strong emotions – love, fear, hatred – and MacLean makes them all, even the awful ones, very real. 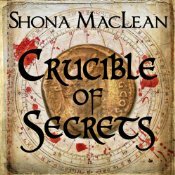 To top it all off CRUCIBLE OF SECRETS has a ripper of a plot that appears at first glance to be treading a well-worn path but which MacLean takes in unexpected directions. The clever kind that have you mumbling that you’d have worked it out yourself if only it wasn’t so swelteringly hot (or maybe it’s only me that likes to think myself cleverer than I really am). I thoroughly recommend this novel and though I would urge you to read the first book of the series because it’s truly brilliant I do think you could easily start the series with this one as it does provide enough back story for you to understand what drives Alexander Seaton. If you’re an audio book fan the narration of this one by Scottish actor David Monteath is a treat. This entry was posted in book review, Scotland, Shona MacLean. Bookmark the permalink. I agree that is a very enjoyable read. Funnily enough I’ve just had book 4 sent to me by quercus. The author has been rebranded as S G Maclean. I’m looking forward to reading the book I have to say. Bernadette – I’m so glad to hear you liked this one. And I couldn’t agree more that MacLean’s got real strengths at depicting characters and at placing the reader. I think she does a terrific job as you point out of depicting all of the written and unwritten ‘rules for behaving’ of the time. Such a difference to now! Bernadette, I enjoyed the first book, but didn’t bother to read number two [can’t remember why now], but will probably try this one on your recommendation.